For performing and touring guitarists who use effects pedals, your pedalboard is one of the most important considerations to be made. You need a pedalboard of adequate size to accommodate all of your effects pedals and power supplies and that is convenient to transport from gig to gig. While a quality pedalboard with flight case is definitely needed for frequent-flying guitarists with a reasonable amount of pedals to transport, locally performing guitarists will also appreciate the extra protection, security, and ease of transport afforded by a quality pedalboard with flight case. The Gator Cases G-Tour Pedalboard-LGW is one such pedalboard that looks to fit the bill. 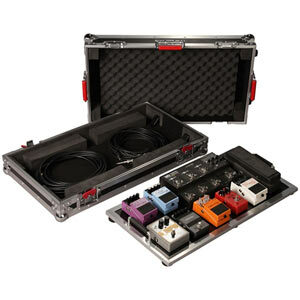 The Gator Cases G-Tour Pedalboard-LGW offers a means to securely transport 10-14 pedals in a rugged Gator quality flight case with removable pedalboard. This is one of the more feature-packed and affordable solutions out there and understandably caught our attention. Is this the best pedalboard with flight case available? You’ll find out in our Gator Cases G-Tour Pedalboard-LGW review. Large TOUR grade pedalboard for 10-14 pedals. 3M “Dual Lock” pedal fastener. Plywood pedalboard with aluminum valance. Pro grade shock absorbing EVA foam interior. Heavy duty Gator Signature hardware. Cable storage included in lower portion of case. 3 spring-loaded carry handles for easy transportation. Inline wheels on flight case. 4 recessed twist latches with 2 sets of lock holes. Visit Gator Cases for more info about the G-Tour Pedalboard-LGW. The Gator Cases G-Tour Pedalboard-LGW is great example of a pedalboard/flight case combo done right. This product hits high marks for the most important factors considered when looking for a pre-made pedalboard. These criteria include durability & pedal protection, ease of use, ease of transport, and reasonable surface area for pedal mounting. I’m going to cover my general experience with the G-Tour Pedalboard-LGW (LGW meaning “Large with Wheels”) and bring up these various points along the way. Upon unboxing the G-Tour Pedalboard-LGW you’ll notice that everything is pretty much ready to go. The pedalboard is completely preassembled, and all that’s left to do is use the included 3M Dual Lock to fasten your pedals to the board. (Of course you should take some time to decide how you want to arrange your pedals before randomly sticking them on.) 3M Dual Lock has become one of the best replacements for velcro when mounting pedals and provides superior grip to keep your pedals safely affixed to your pedalboard. The G-Tour Pedalboard-LGW comes with enough 3M Dual Lock to mount a full assortment of pedals to cover the pedalboard’s surface, but if you’re the type of guitarist that rotates pedals often, you may want to consider picking up an extra roll of Dual Lock. The pedalboard itself is made of plywood and has a sturdy feel that should hold up to the riggers of frequent performance. An aluminum border offers protection around the perimeter of the pedalboard. The 2 handles placed at each end have a tight rugged feel and are held securely in place by bolts on the top and bottom of the pedalboard surface. The handles provide enough room for a comfortable grip and allow easy removal from the flight case for a quick set up and tear down during gigs. 6 rubber pads placed at the 4 corners and at the center edges provide support and a sturdy grip on hard surface floors. The G-Tour Pedalboard-LGW is simply built and perfectly functional. The flight case is fully adorned with aluminum boarders around all surface edges, and the corners are all reinforced with ball case covers to protect the case from impact. The G-Tour Pedalboard-LGW case is ruggedly built to Gator Cases’ high standards to withstand the normal bumping and scuffing that occurs during transport, inspiring confidence that your prized pedals will remain safe within. On the inside roof of the case is a thick layer of foam that will also help to protect your pedals in the event of some kind of serious impact to the case. Those with security concerns will also appreciate that 2 of the 4 total latches have lock holes for keeping meddling hands away from your pedals. If you’ve ever dealt with the inconvenience of lugging around a cumbersome pedalboard from gig to gig, there a few little design perks that are a nice touch to this pedalboard. A single side handle allows one-handed carrying. Those who want to spare any back problems or encourage band teamwork will appreciate the 2 handles at each end of the flight case that allow 2 people to distribute the weight load and quickly carry the case to its destination. Another plus of the G-Tour Pedalboard-LGW are the inline wheels at the end of the case that allow easy movement through airports or across any hard, flat surfaces. You’ll greatly appreciate how much this simple touch aids in transportation. I also like how the G-Tour Pedalboard-LGW has plenty of space beneath the pedalboard for storage. Fitting in a few cables is no problem, and if your guitar case is full, throw in extra strings, spare patch cords, straps, some 3M Dual Lock, or anything else you might need on the road. While Gator Cases estimates that you can use around 10-14 guitar pedals with the G-Tour Pedalboard-LGW, that number may be a bit lower if you plan to use a dedicated power supply for your pedals instead of batteries. Most guitarists seeking a professional pedalboard solution of this type will probably be using a dedicated power supply, so this will eat into your pedalboard real estate a bit and must be considered. All the original photos in this review feature a standard power supply to give you an idea of how to factor that into your potential pedalboard arrangement. The foam inside the roof of the case touches the top of the mounted pedals, so mounting a pedal on top of your power supply isn’t an option. But there’s still plenty of room for a range of at least 8-12 pedals with a dedicated power supply on the board. This is more than sufficient for many guitarists’ needs, but you still can get up to 14 pedals on the board depending on how large your pedals are and where their jacks are located. Here are a few more examples of how pedals of various sizes may be used with the Gator Cases G-Tour Pedalboard-LGW. Above you’ll notice that on the right side of the pedalboard that I placed a column of 3 horizontal positisioned pedals. Above I added a large wah pedal to the pedalboard. There is plenty of room on the G-Tour Pedalboard-LGW to place extra long pedals. Above is similiar to the previous example, but I wanted to show you that there is room to place pedals over the aluminum border of the pedalboard. The 3M Dual Lock elevates pedals slightly, so you can extend over the edges a bit and still have room to close the flight case. This is useful for guitarists who like to make use of every possible bit of space on the pedalboard. The Gator Cases G-Tour Pedalboard-LGW rocks. Let’s see the final result. The Gator Cases G-Tour Pedalbaord-LGW is one of the most viable solutions for any guitarist seeking a reliable pedalboard and flight case combo. The G-Tour Pedalboard-LGW offers solid protection for at least 8-12 pedals with a dedicated power supply. If you’re using smaller pedals, you may be able to squeeze on a few more for up to around 14. The extra storage in the case is a nice bonus, and the outside handles and inline wheels ensure quick and convenient transport in most gigging situations. 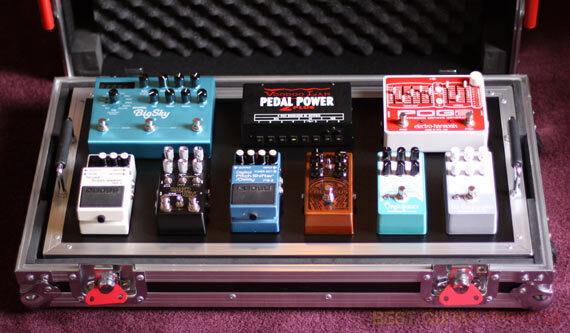 Want the best pedalboard w/ flight case? The Gator Cases G-Tour Pedalboard-LGW is built tough and tough to beat. That concludes our Gator Cases G-Tour Pedalboard-LGW review. Thanks for reading. 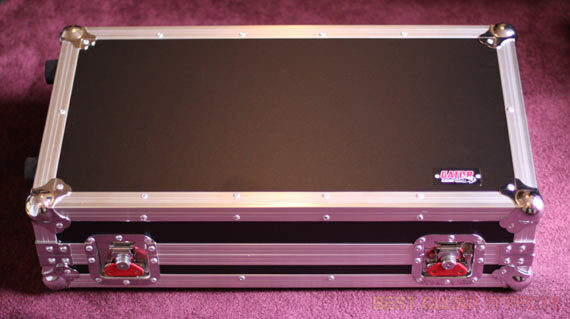 Want to buy the Gator Cases G-Tour Pedalboard-LGW?